Say good-bye to sickle mowers, hand held cutters, chainsaws etc. Designed for abuse, the Outback Brushcutter cuts a clear path through the densest brush, grass and weeds over 8 feet tall, saplings up to 2.0 inches in diameter and other problem vegetation at the rate of 2/3 acre per hour. 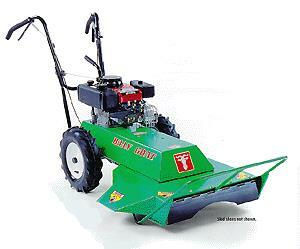 Cut Width 24", Deck Width 27.5"
Length - Overall 82.5" ,Height 43"
* Please call us with any questions you may have about our mower rotary walk behind self propell in Kingsport TN, Johnson City, Elizabethton, Rogersville TN, Gate City VA and the NE Tennessee, SE Kentucky and SW Virginia Tri-State Area.